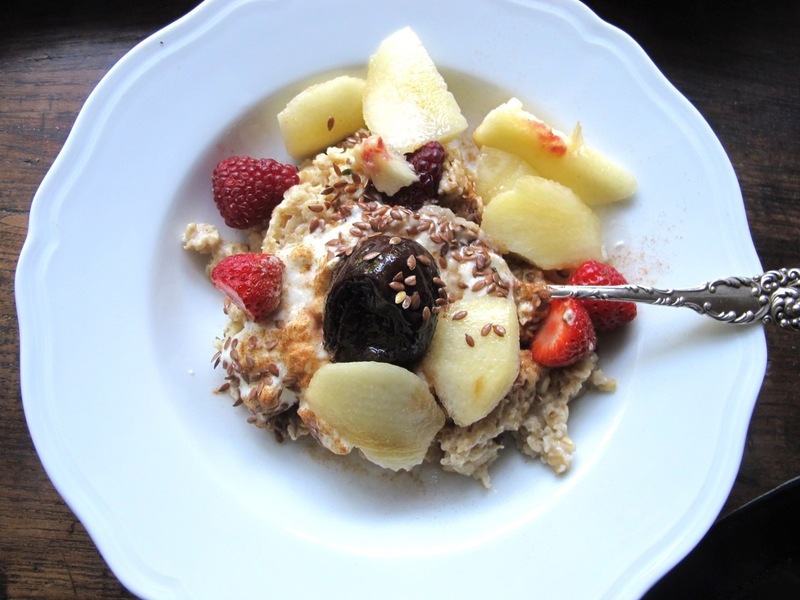 Today is World Diabetes Day–the importance of a good BREAKFAST! Today is World Diabetes Day–Nov 14th, birthday of Fred Banting, who along with Charles Best first discovered insulin, revolutionizing the treatment of diabetes. The World Diabetes Day 2014 campaign marks the first of a three-year (2014-16) focus on healthy living and diabetes. Oysters are the usual opening to a winter breakfast. Indeed, they are almost indispensable. ~ I’m sure my mother said that a few times! Breakfast–before I set off on my walk–is the same every morning (and no sign of an oyster)! Not for me. I look forward to it–once a day, at least! Maybe we are at our most conservative, most in need of ritual, just after waking up. I find the assembling and eating of this bowl of goodies a daily delight. 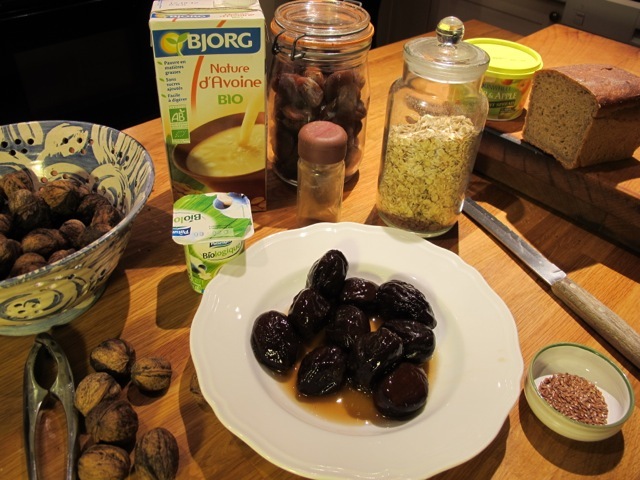 Porridge: small oat flakes cooked in organic milk, organic plain yogurt, a cooked prune, perhaps some seasonal fruit, cinnamon sprinkled over. Neither of us feel the need to snack before lunch–the oats keep us going. Latest estimates* suggest that there are 382 million people living with diabetes worldwide. What makes the pandemic particularly menacing is that throughout much of the world, it remains hidden. In my case, there were NO symptoms. My Type 2 diabetes was picked up in a routine blood test. 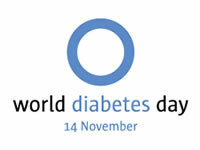 Up to HALF of all people with diabetes worldwide remain UNDIAGNOSED! A simple blood test is all that is needed for a diagnosis. If you have a family history of diabetes, as I did, a routine test is a good idea! Life, within doors, has few pleasanter prospects than a neatly arranged and well-provisioned breakfast table. Jumbo oats, soaked in a small quantity of water for twenty minutes, seasoned with a small amount of sea salt, then heated. Trickle in more water if necessary. After cooking, top off with toasted linseeds and sunflower seeds (I keep a jar full), half a teaspoon of French organic mountain honey, sprinkle of cinnamon, then a minimal amount of milk to finish off. Summer alternative is a banana, a tablespoon of whole fat plain yoghourt (never the low fat version, they replace fat with sugar), a small amount if berry fruit, the toasted seeds (again), the cinnamon (again). No honey this time, too much in the banana and berries to allow any extra. Mine is small oats cooked slowly in skimmed milk, add a little more milk if needed. Drizzle over a teaspoon of honey , then with sprinkle flaked almonds. Thanks, Robin , for your charming blog . It brings back memories of a holiday home we used to own in France. Robin, I cannot wait to show your breakfast to my man, a Vietnam vet whose Type II diabetes ( and heart issues) have been attributed to Agent Orange exposure. . .i am trying very hard to have him eat all whole foods, fruits, veggies and whole grains, and to exercise more. It is hard to break old habits, but since we have been reunited these last few years ( went to high school together!) his numbers have improved and he definitely cares more about his health. . .thank you for being MY support system!!! Oh, Robin and Meredith, thank you for the thoughtful and healthy breakfast suggestions — I thought I might just add one thought — in the middle of winter when it is very cold, we enjoy oatmeal — I usually look for Canadian oats — baked in the oven with cinnamon. It warms the kitchen and makes the house smell like oatmeal cookies! And, it yummy — I’ve also added apple! Thank you for on going love to all of us. I have a question about linseed versus flaxseed. How are they different and why do you prefer linseed? Thanks. They are the same, Susan. Impressive, Deborah–there’s sense in “dull”! Thanks for the article Maurice and congratulations–tremendous achievement and great example.